Pull the correction tape applicator to correct whole sentences or turn it over and push it to cover one or two letters. Great for left- or right-handed use. Covers one line of 12 pt. type or less in one application. 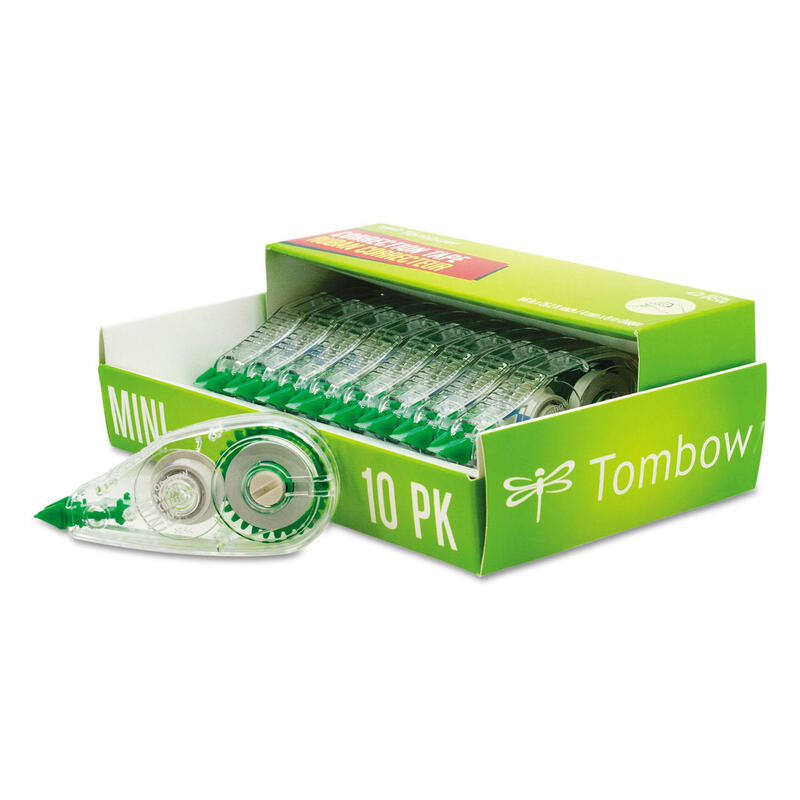 Line Coverage: 1; Tape Width: 1/5"; Tape Length: 472"; Case Color(s): Clear/Green. 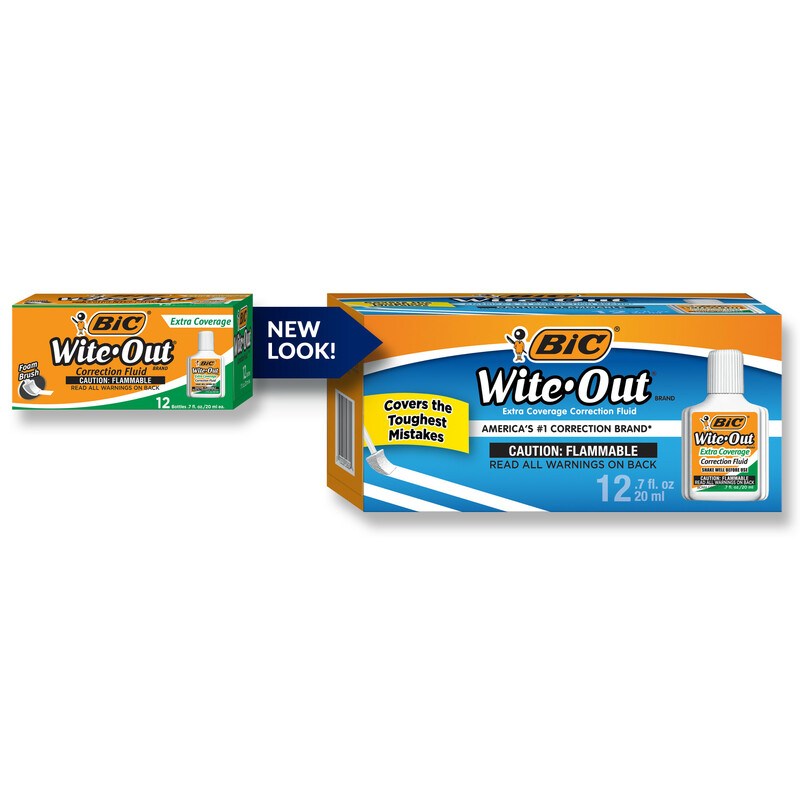 Convenient, easy-to-use dispenser makes correcting mistakes simple. Perfect for single and multiple line corrections. 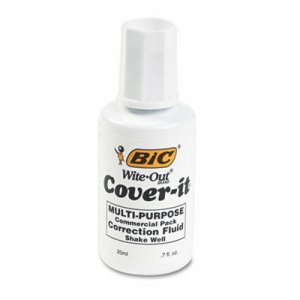 Film-based white tape provides complete, uniform cover-up. Transparent case shows remaining tape. Dispenser is non-refillable. 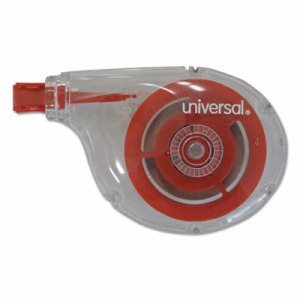 Correction Tape Type: Non-Refillable; Line Coverage: 1; Tape Width: 1/5"; Tape Length: 315". Covers the toughest mistakes, even red ink and permanent marker. It applies evenly and dries to a satin smooth finish. The fluid covers photocopies, faxes, ink, permanent marker and more. Stock up and save! Correction Fluid Type: Foam Applicator; Color(s): White; Applicator Type: Foam; Capacity (Volume): 20 mL. 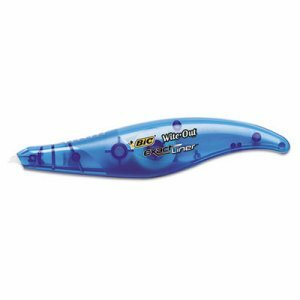 Correction tape features a two-way applicator tip that goes left or right to make whole word or single-letter corrections. Flexible head smoothly applies tape. Tear-resistant. 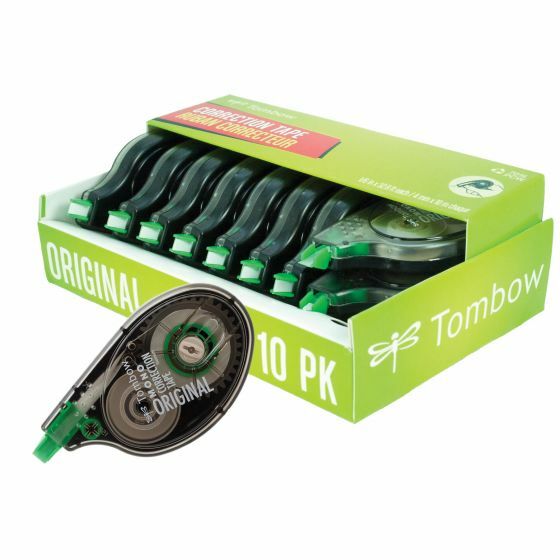 Line Coverage: 1; Tape Width: 1/5"; Tape Length: 393"; Case Color(s): Clear/Green. MONO� Correction Tape is the original single-line correction tape. The compact, easy-to-use side-action applicator simplifies accurate application to instantly correct typed or handwritten documents. Dual Gear technology features a self-tightening mechanism which prevents tape looping and pulling. Make instant corrections with no drying time � no mess and no waiting! The ergonomic design allows you to comfortably make corrections throughout the work day. Easily adjust break-proof tape with the rewind knob. Premium-quality tape allows you to re-write with pen, pencil or marker. Non-refillable. 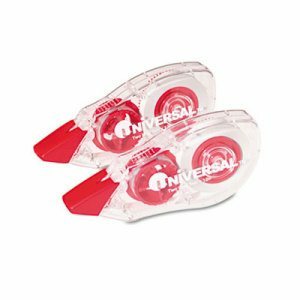 Correction Tape Type: Non-refillable; Line Coverage: 1; Tape Width: 1/6"; Tape Length: 394". Opaque fluid lays down smoother with no show-through or flaking. The fine-point metal tip corrects small print; pocket clip gives you on-the-go convenience. Ozone-safe formula is environmentally friendly. Provides extra-long use. Correction Fluid Type: Pen Applicator; Color(s): White; Applicator Type: Pen Tip; Capacity (Volume): 12 mL. Fast drying to prevent smearing. It offers extra coverage for smooth, one-time applications. This multi-purpose fluid corrects ink, faxes, copies, etc. Correction Fluid Type: Brush Applicator; Color(s): White; Applicator Type: Brush; Capacity (Volume): 20 mL. Spatula type applicator, covers in one use. Clean and no mess. Covers 12 point type with one application. Comfortable and ergonomic dispenser. 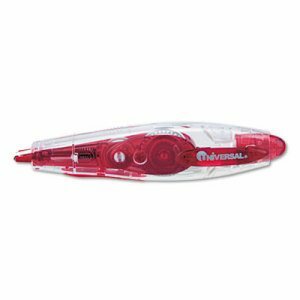 Line Coverage: 1; Tape Width: 1/4"; Tape Length: 394"; Case Color(s): Clear/Red. Fix mistakes fast. The tape applies dry, so you can write over it instantly! The tape is tear-resistant and film-based for easy and convenient correction. It is fast, clean and easy-to-use. The translucent body provides visible tape supply. Stock up and save! 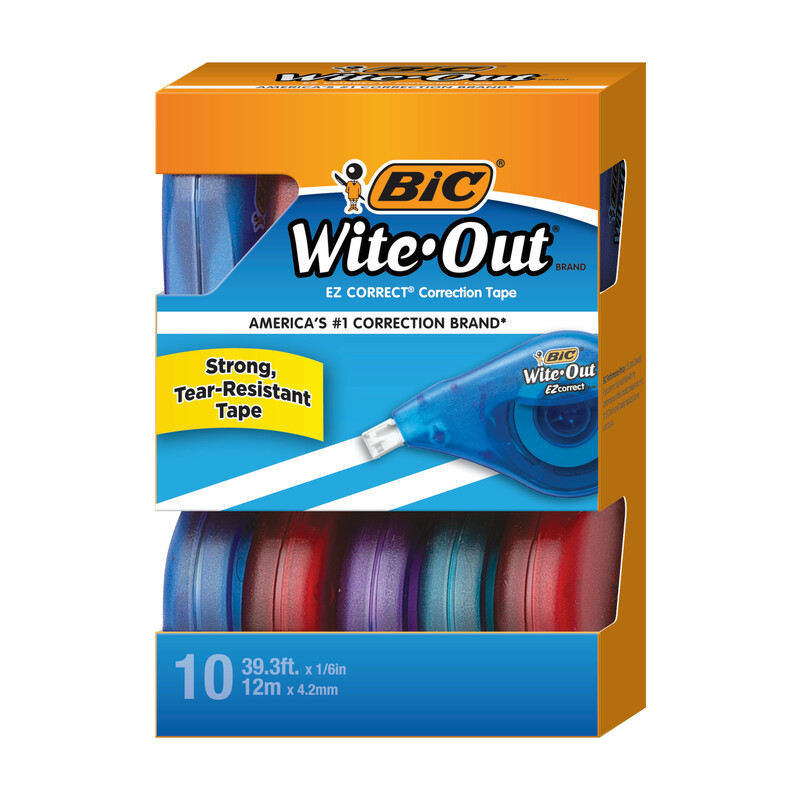 Line Coverage: 1; Tape Width: 1/6"; Tape Length: 472"; Case Color(s): Blue/Orange. 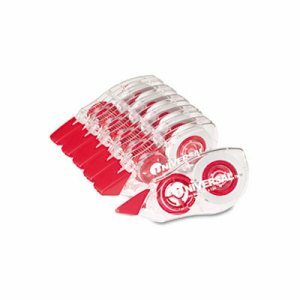 DryLine Grip Correction Tape, Non-Refillable, 1/5" x 335" DryLine Grip Correction Tape, Non-Refillable, 1/5" x 335"
Super-strong polymer-backed correction tape fixes mistakes instantly with no mess. Dispenser with grip applicator is easy to hold. Sliding guard protects the tip from damage. Line Coverage: 1; Tape Width: 1/5"; Tape Length: 335"; Case Color(s): Gray/Green. MONO� Correction Tape is the original single-line correction tape. The compact, easy-to-use side-action applicator simplifies accurate application to instantly correct typed or handwritten documents. Dual Gear technology features a self-tightening mechanism which prevents tape looping and pulling. Make instant corrections with no drying time � no mess and no waiting! The ergonomic design allows you to comfortably make corrections throughout the work day. Easily adjust break-proof tape with the rewind knob. Premium-quality tape allows you to re-write with pen, pencil or marker. Non-refillable. Stock up and save! 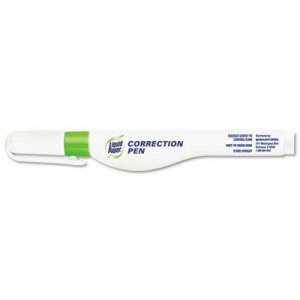 Correction Tape Type: Non-refillable; Line Coverage: 1; Tape Width: 1/6"; Tape Length: 394". Features a needle point tip for accurate, precise corrections. The fast-drying fluid dries to a smooth finish. The soft squeeze barrel provides increased control. The fluid covers photocopies, faxes, ink, permanent marker, and more. Correction Fluid Type: Pen Applicator; Color(s): White; Applicator Type: Needle Tip; Capacity (Volume): 8 mL. 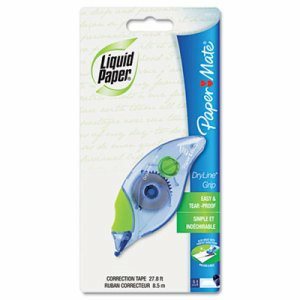 Liquid Paper� all-purpose correction pen features squeeze control that allows the correction fluid to be dispensed evenly and accurately. Double-ball, precision tip resists clogging and extends the life of the pen. 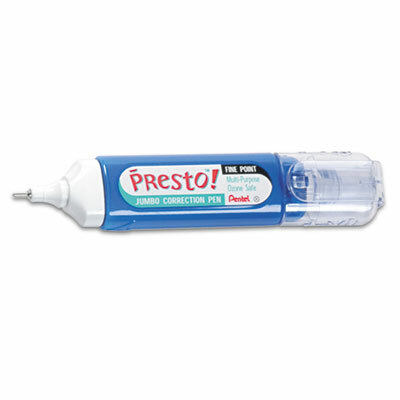 Precise tip is ideal for correcting individual letters and numbers. 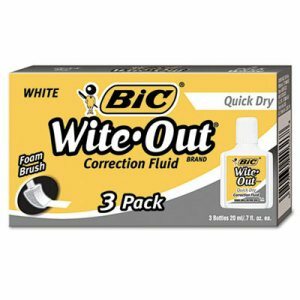 Correction fluid is fast-drying to allow for premium coverage. Correction Fluid Type: Pen Applicator; Color(s): White; Applicator Type: Pen Tip; Capacity (Volume): 6.8 mL. 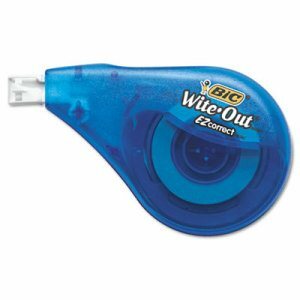 Wite-Out EZ Correct Correction Tape, Non-Refillable, 1/6" x 472" Wite-Out EZ Correct Correction Tape, Non-Refillable, 1/6" x 472"
Fix mistakes fast. The tape applies dry, so you can write over it instantly! The tape is tear-resistant and film-based for easy and convenient correction. It is fast, clean and easy-to-use. The translucent body provides visible tape supply. 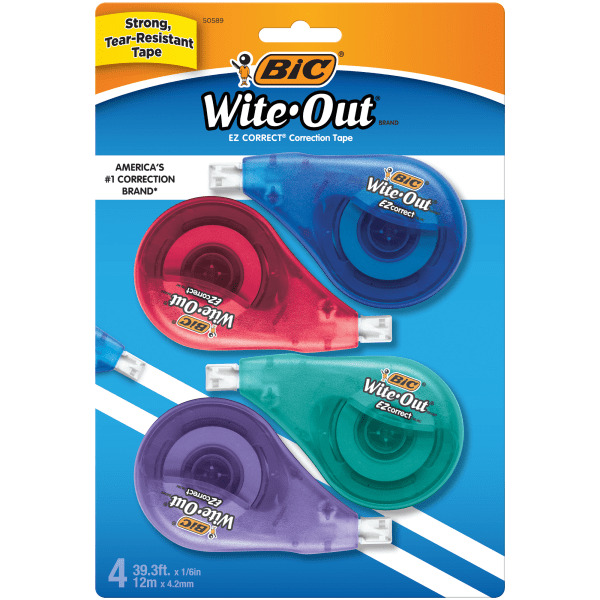 Line Coverage: 1; Tape Width: 1/6"; Tape Length: 472"; Case Color(s): Blue. 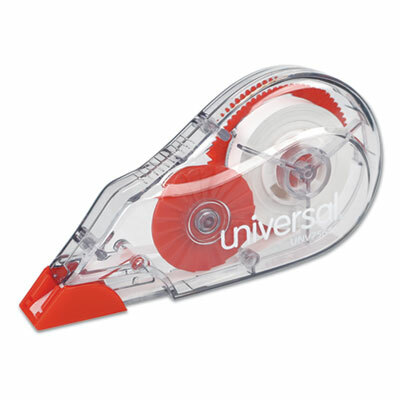 Pen-style correction tape dispenser is ergonomically designed to fit your hand for maximum comfort. Two-way function provides flexibility�pull the applicator to the right for correcting whole sentences, or push to the left if you only need to correct a single letter. Retractable tip cover protects tape when not in use. Great for left- or right-handed use. 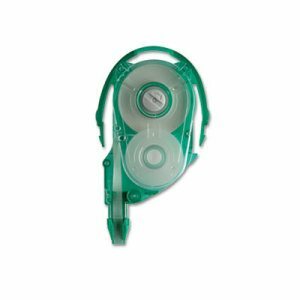 Line Coverage: 1; Tape Width: 1/5"; Tape Length: 236"; Case Color(s): Clear/Green. Fix mistakes fast. The tape applies dry, so you can write over it instantly! The tape is tear-resistant and film-based for easy and convenient correction. It is fast, clean and easy-to-use. The translucent body provides visible tape supply. 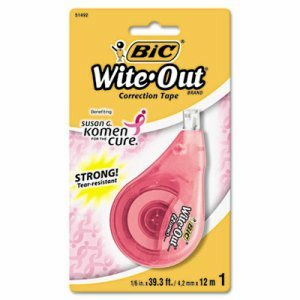 Line Coverage: 1; Tape Width: 1/6"; Tape Length: 472"; Case Color(s): Pink. Convenient mini-size dispenser fits in pencil cases and most planners. Film-based white tape ensures reliable performance. 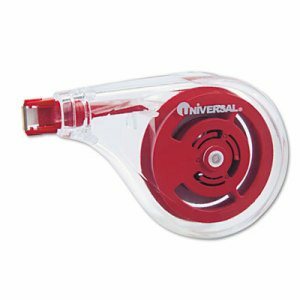 Line Coverage: 1; Tape Width: 1/4"; Tape Length: 275"; Case Color(s): Clear/Red. Fix mistakes fast. The tape applies dry, so you can write over it instantly! The tape is tear-resistant and film-based for easy and convenient correction. It is fast, clean and easy-to-use. The translucent body provides visible tape supply. Line Coverage: 1; Tape Width: 1/6"; Tape Length: 400"; Case Color(s): Blue/Orange. Naturally shaped to fit your hand. It makes fast, easy, precise corrections. The tape is tear-resistant and film-based. It applies dry so you can write over it instantly! The grip zone provides comfort and control for easy and convenient correcting. Line Coverage: 1; Tape Width: 1/5"; Tape Length: 236"; Case Color(s): Blue/Orange. Fix mistakes fast. The tape applies dry, so you can write over it instantly! The tape is tear-resistant and film-based for easy and convenient correction. It is fast, clean and easy-to-use. The translucent body provides visible tape supply. Line Coverage: 1; Tape Width: 1/6"; Tape Length: 472"; Case Color(s): Blue/Orange. MONO Mini Correction Tape, Non-Refillable, 1/6" x 315" MONO Mini Correction Tape, Non-Refillable, 1/6" x 315"
MONO� Mini Correction Tape corrects mistakes quickly and cleanly. Compact size is perfect for backpacks, planners, purses and more. Top action applicator with ribbed grip offers comfortable left-hand or right-hand use. Dual Gear technology features a self-tightening mechanism which prevents tape looping and pulling. Make instant corrections with no drying time � no mess and no waiting! Easily adjust break-proof tape with the rewind knob. Unique design allows you to comfortably make corrections throughout the work day. Premium-quality tape allows you to re-write with pen, pencil or marker. Non-refillable. 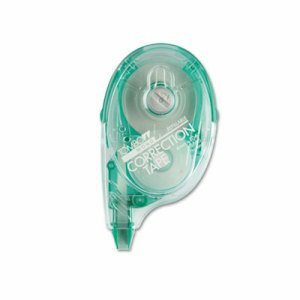 Correction Tape Type: Non-refillable; Line Coverage: 1; Tape Width: 1/6"; Tape Length: 315". MONO Correction Tape Refill, 1/6" x 472" MONO Correction Tape Refill, 1/6" x 472"
Refill for MONO� standard correction tape applicators. Snap-in cartridge is easy to refill. Dual Gear technology features a self-tightening mechanism which prevents tape looping and pulling. Make instant corrections with no drying time � no mess and no waiting! Easily adjust break-proof tape with the rewind knob. Premium-quality tape allows you to re-write with pen, pencil or marker. 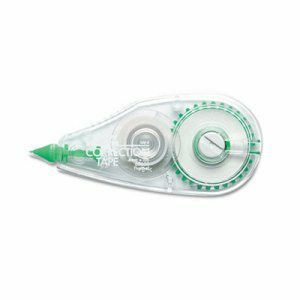 Correction Tape Type: Refill; Line Coverage: 1; Tape Width: 1/6"; Tape Length: 472". 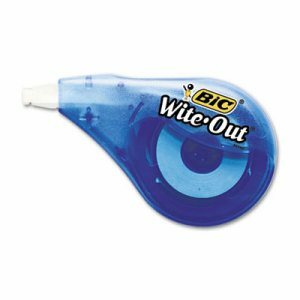 Wite-Out Exact Liner Correction Tape, Non-Refillable, Blue, 1/5" x 236" Wite-Out Exact Liner Correction Tape, Non-Refillable, Blue, 1/5" x 236"
Naturally shaped to fit your hand. It makes fast, easy, precise corrections. The tape is tear-resistant and film-based. It applies dry so you can write over it instantly! The grip zone provides comfort and control for easy and convenient correcting. Line Coverage: 1; Tape Width: 1/5"; Tape Length: 236"; Case Color(s): Blue. Goes on easy and provides reduced dry time! The fluid covers photocopies, faxes, ink, permanent marker and more. Correction Fluid Type: Foam Applicator; Color(s): White; Applicator Type: Foam; Capacity (Volume): 20 mL. 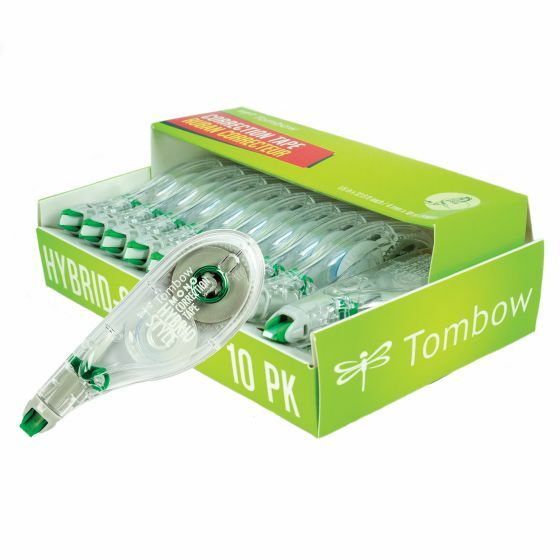 MONO� Hybrid� Correction Tape combines the convenience of a side-action applicator with the full view of a pen. This unique design allows you to comfortably make corrections throughout the work day. 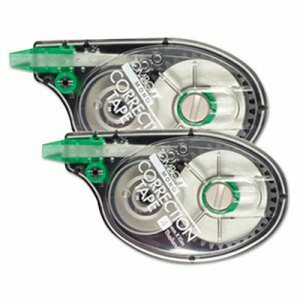 Single-line correction tape is perfect for correcting mistakes on typed or handwritten documents. The pivoting tape head delivers ultra-smooth tape application. Make instant corrections with no drying time � no mess and no waiting! Dual Gear technology features a self-tightening mechanism which prevents tape looping and pulling. Retractable tip cover protects tape when not in use, making it safe to store in a pencil cup or desk drawer. Premium-quality tape allows you to re-write with pen, pencil or marker. Easily adjust break-proof tape with the rewind knob. Ergonomic applicator is comfortable for both right and left hand use. Non-refillable. Stock up and save! 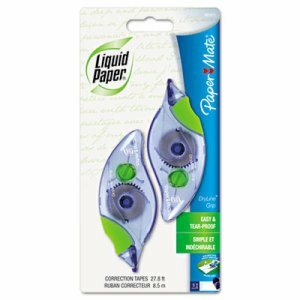 Correction Tape Type: Non-refillable; Line Coverage: 1; Tape Width: 1/6"; Tape Length: 394". Turn-screw feature allows you to rewind the tape in case of looping. Side applicator makes it easy to see your errors as you correct them, so you never use too much or too little tape. Tape lays down smooth and corrects instantly, no drying time, no mess--copy, fax, edit or type immediately after applying. Strong, break-resistant and tear-proof. Transparent dispenser simplifies roll/spool monitoring, so you'll know exactly when you're running low. Line Coverage: 1; Tape Width: 1/6"; Tape Length: 472"; Case Color(s): Green/Purple. 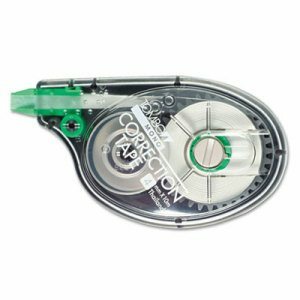 MONO Refillable Correction Tape, 1/6" x 472" MONO Refillable Correction Tape, 1/6" x 472"
MONO� Correction Tape is the original single-line correction tape packaged in a convenient refillable applicator. The compact, easy-to-use side-action applicator simplifies accurate application to instantly correct typed or handwritten documents. Dual Gear technology features a self-tightening mechanism which prevents tape looping and pulling. Make instant corrections with no drying time � no mess and no waiting! The ergonomic design with rubber grip allows you to comfortably make corrections throughout the work day. Easily adjust break-proof tape with the rewind knob. Premium-quality tape allows you to re-write with pen, pencil or marker. Easily refill with snap in cartridges. Refill cartridges available in four vibrant colors. 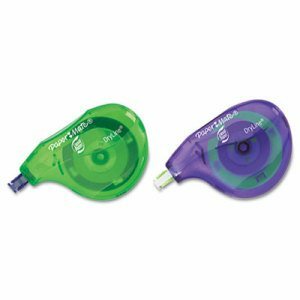 Correction Tape Type: Refillable; Line Coverage: 1; Tape Width: 1/6"; Tape Length: 472". MONO� Mini Correction Tape corrects mistakes quickly and cleanly. Compact size is perfect for backpacks, planners, purses and more. 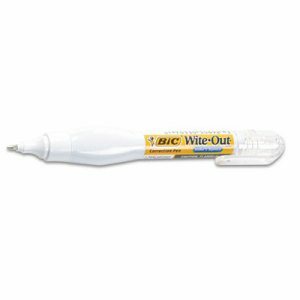 Top action applicator with ribbed grip offers comfortable left-hand or right-hand use. Dual Gear technology features a self-tightening mechanism which prevents tape looping and pulling. Make instant corrections with no drying time � no mess and no waiting! Easily adjust break-proof tape with the rewind knob. Unique design allows you to comfortably make corrections throughout the work day. Premium-quality tape allows you to re-write with pen, pencil or marker. Non-refillable. Stock up and save! Correction Tape Type: Non-refillable; Line Coverage: 1; Tape Width: 1/6"; Tape Length: 315".